Maverick’s Finder is outrageously handy. It not only gives you convenient access to multiple windows, but also offers ways to tweak what you see till you get what works best for you. Adding whatever folder you like to the Sidebar is easy. All you need to do is select the item you want to add and choose File→Add to Sidebar from the menu bar (or press Shift+Option+T). You can now reach the item by clicking it in any Finder window’s Sidebar. And you can move files or folders into that folder by dragging them onto the Sidebar icon for the item. To remove an item from the Sidebar, right-click or Control-click the item and choose Remove from Sidebar. 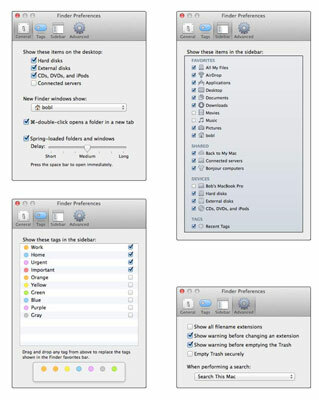 You can find Finder and Desktop preferences by choosing Finder→Preferences. In the Finder Preferences window that appears, click the icons in the toolbar to select one of the four Finder preference panes: General, Tags, Sidebar, and Advanced. Show These Items on the Desktop check boxes: Select or deselect these check boxes to choose whether icons for hard drives; external disks; CDs, DVDs, and iPods; and connected servers appear on the Desktop. OS X Mavericks (and Mountain Lion before it) deselects all four options by default (which differs from earlier versions of Mac OS, which enabled all four by default. New Finder Windows Show: Here, you can choose whether opening a new Finder window displays All my Files, your Home folder, the Documents or Desktop folders, or any other disk or folder. Command-Double-Click Opens a Folder in a New Tab check box: Selecting this box spawns a new tab in the current window when you Command-double-click a folder or disk. Spring-Loaded Folders and Windows: This one’s easier to do than to explain, so do this: Select the check box to enable the feature and then drag any icon (except a disk icon) onto any folder or disk icon. When the folder or disk icon is highlighted, don’t release the mouse button. After a delay, the highlighted folder icon “springs” open. If you drag the item onto another folder now, that folder springs open. And so on. This continues until you release the mouse button, at which time the item you’re dragging is dropped into whichever folder is open at the time. Notice that each time you drag the item onto a different folder the previous folder springs shut automatically. Previous versions of OS X featured colored Labels, but Mavericks takes it to a new level, replacing Labels with Tags. The Tags pane is where you manage your tags, which appear in the File menu, the right- or Control-click shortcut menu, the Sidebar, and the toolbar. You can see a file or folder’s tags in Finder windows, Get Info windows and inspectors, and Open and Save sheets, and you can use them as criteria for searches and Smart Folders. To rename a Tag, click its name and type a new one. To change a Tag’s color, click the colored circle to the left of its name and choose a different color. Check the boxes for Tags you want to appear in the Sidebar and toolbar. To see your unchecked Tags in the Sidebar or toolbar, click All Tags in (Sidebar) or Show All (toolbar). Choose File→Tags and click one or more of the colored dots in the Tags section. Right- or Control-click and click one or more of the colored dots in the Tags section of the shortcut menu. Click the Tags button in the toolbar and click one or more of the Tags. To create a custom Tag on the fly: Right- or Control-click an item, choose Tags, type a label for the new tag, and then press Return. To untag an item: Right- or Control-click the item, choose Tags, select the tag you want to remove, and then press Delete. To remove every instance of a Tag from every file and folder on your disk: Right- or Control-click the Tag in the Tags pane of Finder Preferences, and then choose Delete Tag. Deleting a Tag won’t delete the items; it just removes that Tag from every item. Click the Tags in your Sidebar to see every file on all connected hard disks with that tag. The Sidebar pane lets you choose which items are displayed in the Sidebar. Select the check box to display the item; deselect the check box to not display it. Show Warning before Changing an Extension check box: Allows you to turn off the nagging dialog that appears if you attempt to change the two-, three-, four-, or more-character file extension. Show Warning Before Emptying the Trash check box (on by default): Allows you to turn off the nagging dialog telling you how many items are in the Trash and asking whether you really want to delete them. Empty Trash Securely check box: Makes Secure Empty Trash the default. The Secure Empty Trash feature overwrites deleted files with meaningless data so neither the files nor their contents can be recovered. When Performing a Search pop-up menu: Lets you choose the default search location when you initiate a search. 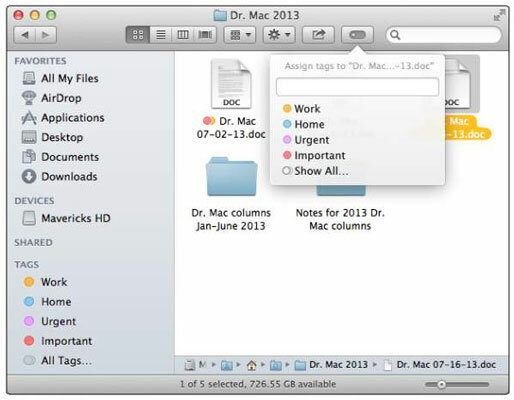 Your choices are Search This Mac, Search the Current Folder, and Use the Previous Search Scope.